A high price of traditional fuel (gas and heating oil) encourages to search for new cheaper fuel to reduce the cost of thermal energy. One of the most promising new products is coal water slurry fuel – a mixture of coal particles (fraction 1 … 70 μm), water and reagent. It is characterized by a good heating value and a high degree of combustion. Coal-water slurry fuel is produced from coal which has a high content of volatile substances. It is delivered to an open platform, then a front loader feeds it into a receiving hopper of a grinder. Coal can be ground by ball mills, roller mills and hammer mills. Practically each of these mills is a complex and bulky equipment, that uses a lot of power. 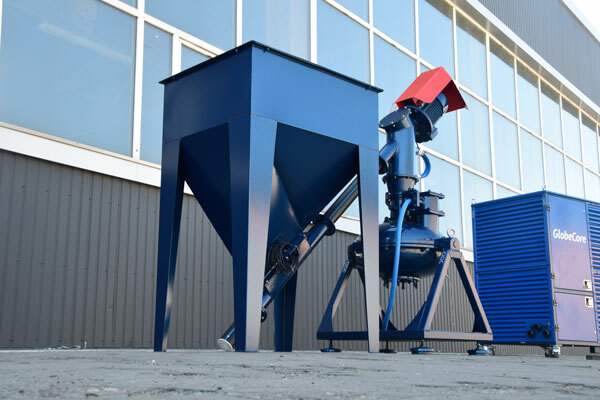 This calls for new and more efficient grinders for preparation of coal water slurry fuel. The design of the first AVS was proposed in the 60s of the last century. This device is an induction motor, that has an operating chamber instead of a rotor. The device is connected to a three-phase electric power that creates a rotating electromagnetic field of the industrial frequency. The material and ferromagnetic elements are fed into the operating chamber. They begin to rotate and collide under the influence of electromagnetic field and other factors (high local pressure, electrolysis, acoustic impact, etc. ), causing intensive dispersion and mixing of coal-water slurry fuel components. An AVS unit doesn’t have the disadvantages of traditional industrial mills that have large overall dimensions and low energy efficiency. In addition, AVS can be integrated into existing lines for coal-water slurry fuel production without significant changes and costs. calorific value of produced fuel is 42,000 kcal. Thus, it is possible to produce water-coal fuel on AVS-150 using cheap coal slurry, which is as good at heat transfer as gas or heating oil and more economical than they are. co-combustion of coal and biomass. Contact us to leave an application for purchase of AVS for the of coal-water slurry fuel production.